We’d love your help. Let us know what’s wrong with this preview of Charmed by Erica Schultz. Dynamite Entertainment is proud to continue the story of Phoebe, Piper, and Paige, television's fan-favorite witches, in all-new adventures set within the official continuity of Charmed! A dark force has set its sights on the art world of San Francisco, utilizing a gallery exhibit to feed souls to the underworld and unleash demons into our reality. Only the Power of Three, Dynamite Entertainment is proud to continue the story of Phoebe, Piper, and Paige, television's fan-favorite witches, in all-new adventures set within the official continuity of Charmed! To ask other readers questions about Charmed, please sign up. Situated in the 4th season of the show, apparently after the fourth episode, because Paige is there and there is a brief mention of Cole as a lawyer and nothing more. It is a typical adventure of the witches, with a villain invested in get rid of them; Paige interested in some guy; Phoebe with struggles at the paper; and Piper trying to mantain business and sisters afloat. Is kind of hard to fit in the continuity of the series. The Underworld is depicted with weak demons and the Source is never mentioned. All this aside, the plot of Djall in not really bad, but it does not bring anything new. Something I was hoping to see in this type of delivery. My biggest problem is with the art. By the way they are drawn, the sisters are indistinguishable from each other, I often confuse them. Also, the demons and warlocks are drawn more like vampires than anything else; there are no different colors or different shapes that could be used with this medium and without having to invest much in special effects and makeup. I like the cover with the 3 sisters inside the canvas. I honestly don't have anything to really get upset about when it comes to this graphic novel/comic. Charmed will always be one of my favorite shows and everyone knows its cheesy as hell (no pun intended) because the effects of the 90s and all but I still love it. I will never get tired of their sisterly quips and snarky comments. Also the big part of me even picking up a graphic novel is the artwork. If I don't like the style I won't read it. But this was a perfect comic adaptation and they looked almost exactly as the actresses and actors that played in charmed. There could have been a little bit more difference in Paige and Phoebe's style I admit I confused them a few times but other than that it was awesome. Okay so i am not at all a Comic book /Graphic novel kind of reader. AT ALL! I still try sometimes. And i am ALWAYS disappointed. Sadly. But i LOVE Charmed. So of course when i saw a book on NetGalley about them i just had to request it. Because how bad can something with the charmed sisters be? Now as i said i am not an avid reader of this type of book. So maybe the problem with the very jumpy and not really streamline story telling was my personal problem. But the entire boo Okay so i am not at all a Comic book /Graphic novel kind of reader. AT ALL! But the entire book felt very unfinished, very mixed up and strangely put together, as if big junks of the story were missing. It also was set during a strange time. We never actually get told when this takes place and technically it should be taking place AFTER season 7 since Paige has charges BUT Cole is in here and Piper and Leo clearly don't have kids yet so it would fit more into early to mid- Season 4. Which is just one example of many of things that completely confused me in this! The actual story itself is also very strange and unfinished feeling jumping back and forth between the personal lives of the sisters, the "big bad" and the magical fighting. It all mixed up together in a very strange and not fitting way that it just got confusioning and felt like too much was happening when actually nothing really was happening. Also the actual magical moments where NOTHING new at all, but just very typical stereotype charmed "filler" episode. Meaning that it felt like one of those episodes where a small baddie needed to come up before the next few episodes would be filled with the big fighting against the actual bad. If you want to take on something as epic as charmed? Do it better. Do it right. This sadly was not that at all. Charmed is one of my favorite TV shows so I was excited to see this at NetGalley. I didn't even know there was a comic series based on the show but I don't read many comics these days. Sadly, this was a big disappointment. The artwork was poor, lacking definition and detail. Where the characters from the show were concerned, the resemblances were poor. Extreme facial close-ups were actually well done but other positions and angles often resulted in barely recognizable people. The story, and some Charmed is one of my favorite TV shows so I was excited to see this at NetGalley. I didn't even know there was a comic series based on the show but I don't read many comics these days. Sadly, this was a big disappointment. The artwork was poor, lacking definition and detail. Where the characters from the show were concerned, the resemblances were poor. Extreme facial close-ups were actually well done but other positions and angles often resulted in barely recognizable people. The story, and some of the artwork, were full of cliches and stereotypes and often seemed pulled from the show, mixed and spat back out again. Towards the end, the story started to get a life of its own and become interesting but by then the story was almost over. The ending felt rushed as the last 10 or so pages, unbeknownst to me, consisted of alternate covers for the issues collected in the book. As I didn't expect that, I kept looking at the page numbers, thinking the pacing was off. Overall, not recommended for fans or or new readers. I was (and still am) a huge fan of Charmed. It was one of my must-see TV series back in the day. I loved watching the Charmed Ones battling demons, and trying to have somewhat normal lives in-between vanquishing evil and protecting innocents. It remains a favorite of mine, so I was excited to discover this graphic novel and couldn't wait to see what sort of trouble was brewing for sisters. The timeline of this story is set in season four of the series. Quick recap: Season three ended with the dea I was (and still am) a huge fan of Charmed. It was one of my must-see TV series back in the day. I loved watching the Charmed Ones battling demons, and trying to have somewhat normal lives in-between vanquishing evil and protecting innocents. It remains a favorite of mine, so I was excited to discover this graphic novel and couldn't wait to see what sort of trouble was brewing for sisters. The timeline of this story is set in season four of the series. Quick recap: Season three ended with the death of Prue (the oldest Halliwell sister). Without the Power of Three, the Charmed Ones are no more. In the beginning of season four, Piper and Phoebe discovered they have a younger half-sister named Paige Matthews—who is half-witch, half-whitelighter. The Power of Three is restored, and Paige's ability to orb is very handy in a fight. Charmed: A Thousand Deaths kicks off with an action sequence that will be all too familiar to fans of the show: the sisters working together to fight a demon in an alleyway. The tag-team use of powers mixed in with physical blows, the witty banter between the sisters, and the overly confident speech of the demon—right before he's vanquished—swept me back into the magical world of the Charmed Ones as if I'd never left. The story could easily have been an episode of the series. It flowed effortlessly, transitioning from the sisters trying to balance their lives and their magical duties, to a band of demons in the Underworld plotting their dastardly deeds and discussing how to do away with the sisters, and back again. I may have been reading comic panels and looking at illustrations, but in my mind, I could clearly see it all as if it had aired on TV. When I'm reading a novel or graphic novel that is based on a TV series, that's exactly what I hope will happen. The story is excellent, and the artwork is gorgeous. This is a great read for die-hard Charmed fans. And if you've never seen Charmed, but love stories involving magic and good versus evil? I'm willing to bet you'll love it, too. Check it out! I was excited and skeptical when I started this. I love Charmed, it was a huge part of my life growing up. I've seen episodes more times than I can remember so I was worried this was gonna let me down but it didn't. The story flows perfectly as it would in an episode and there's mentions and cameos of some of the boys in their lives. Timeline wise this would fit before everything that happened with Chris and Wyatt in the sh I received this book through Netgalley in exchange for an honest review. I was excited and skeptical when I started this. I love Charmed, it was a huge part of my life growing up. I've seen episodes more times than I can remember so I was worried this was gonna let me down but it didn't. The story flows perfectly as it would in an episode and there's mentions and cameos of some of the boys in their lives. Timeline wise this would fit before everything that happened with Chris and Wyatt in the show in case you are wondering. I wasn't sure what time it would take place in their lives when I started. My only real problem is with the art. I liked the art for the most part. However, I didn't like the issue covers. The covers use actual images from the show instead of the art used through the book. There are some options at the end that I feel would have been a better choice since they are more consistent with the rest of the book. If you're expecting the characters to look exactly like the original characters in the show, there are some small discrepancies. Piper looks the most like real life Piper. When I spotted this I was just hit with a wave of nostalgia. I watched this whole series back when it aired. It was amazing, it was sad, it was hilarious, it was exciting, and I was sad when it all came to an end. So I just had to read this one and see if it was as good as the series was. Note: This book takes place after season 3 (due to the fact Paige is there). So, I just adored the story, it is just like the episodes in the se I received this book from Netgalley in exchange of an honest review. So, I just adored the story, it is just like the episodes in the series. There is a creepy villain, and our sisters have to do everything to stop him. But first they have to figure out what and who he is. Sadly, it seems our demon in this one isn’t from the books. The things the demons did, and all that happened? Pretty exciting and interesting, but while it was very exciting, I still feel that this story would have worked a bit better as a tv special or an episode rather than a comic. Also how did the sisters not notice THAT. I would think that they would instantly notice the change, and especially when she said he knew about her being a witch. I know from the series it wasn’t really something you just told people. The characters are also perfect. It was so nice to see them again, and see them with all their personalities still attached. That was a bit of a worry to me. Would this artist/writer capture the girls right? Or would they change them? Thankfully they went for keeping them intact! It was so much fun to see them interact with each other. You could see that this one is set a bit later, considering the fact that Paige is accepted by her sisters and how they interact together. Though nothing beats the sisterly love between Piper and Phoebe. I had a big snort at the name of one of the guys: Mr. Wiskunde or as that would mean in my language: Mr. Maths. What a fitting name for a guy with that job. And I had a very big laugh at that part where Leo was running away like a girl from a lightning ball. Whut? That is not at all how Leo would do things! The art was a bit weird. At times too fake-realistic (just like someone cut heads out of a photo-book or from screenshots, added some blur and maybe some cartoonish effect), but at times the people just look like someone went through minimal effort to make them look good. At times I didn’t even recognise the main characters. Plus sorry, I just didn’t quite like the Issue Covers in between the stories. Like someone had a bit too much fun with stills/shots from the series and photoshop. It would be nice for things as bonus art with a dvd/bluray of the series, but to use them in a comic series? Nah. Not so much. The ending? sighsOf course… Nope, not a favourite of mine. I didn't end up finishing this one because it expired but I read about half of it and I wasn't interested in finishing it. I love Charmed and was so excited to read this but in the end I found myself bored and I actually forget I had picked this up more then once. The story was just okay. It was nice to see my favorite characters again as I LOVED the show. However I didn't really like the art work and the story was just alright for me. Charmed – A thousand deaths is a new comic, published by Dynamite, that brings to life the adventures of the Halliwell sisters after the end of the tenth season. This volume, however, is not the continuation of previous publications, on the contrary, it is defined as a canon one-shot story set during the fourth season of the show. 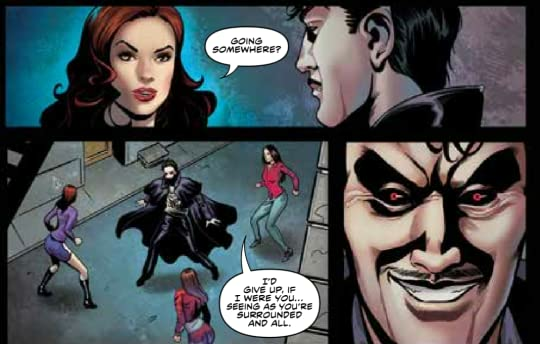 As happened in many episodes of the show, Djall, a demon that wants to be important in hell, develops a plan that will allow him to separate the power of the three and t Charmed – A thousand deaths is a new comic, published by Dynamite, that brings to life the adventures of the Halliwell sisters after the end of the tenth season. As happened in many episodes of the show, Djall, a demon that wants to be important in hell, develops a plan that will allow him to separate the power of the three and to defeat it. The story takes place in the world of art, that includes new characters, such as Gabe, an old friend of Paige, and Shaina, one of her guarded. The close-ups are very beautiful because they are able to capture all the facial features of the actresses who portrayed Piper, Phoebe and Paige. Unfortunately, however, when these are portrayed from afar, they are often confused by the reader who places his attention on the suits of the sisters in order to understand which of them is. As for the drawings, this volume reminded me of the first comics of Buffy the vampire slayer, also because demons and warlocks are represented more as vampires than with demonic features. I appreciated the reference to Cole‘s character and I laughed hard on the pear symbol on Piper’s computer and smartphone. Despite I read many negative reviews, I decided to read this new publication, which, just looking at the cover, gave me some sense of nostalgia. And I must say I did not find it as bad as I thought. It’s a classic filler story of the Charmed universe, nothing more, nothing less. But it’s definitely a sliding reading recommended to the fans of the series. I enjoyed the TV show and have followed the latest seasons in comic book form, but this graphic novel was hard to enjoy. The story throws back to the time period in the story where Paige is there but Phoebe and Cole are not yet a thing (though he is mentioned in passing). That being said, the illustrator does a wonderful job of catching the '90s fashion and that was my first indication that this story didn't continue from the last comic I had read. The comic story is a stereotypical Charmed story: I enjoyed the TV show and have followed the latest seasons in comic book form, but this graphic novel was hard to enjoy. The comic story is a stereotypical Charmed story: demons find a way to possession humans and one of Paige's friends is involved. Specifically, A Thousand Deaths focuses on a portal demon who uses paintings as a way for demons to take over the body of humans but their souls are transported to the under world. When Paige finds out the demon that has been stalking them is using her painter friend Gabe, Paige becomes emotionally involved. Shania, one of Paige's wards, is an artist too and helps the Charmed Ones with their demon problem. The story gets even more predictable from there. Paige ends up doing exactly what you thinks she will. The antagonist's back story is so typical and boring. There is nothing exciting or new for the Charmed world. I was really disappointed after reading Season 10. This is glib and boring while the previous comics gave new story, new insight and put the Charmed Ones in new roles. These had more depth of character, morality, humanity, and the spiral world. A Thousand Deaths takes the most mediocre episodes of the show and makes a comic out of it. I really enjoyed this graphic novel! I am a huge fan of Charmed (the TV show) and I had a blast being back in their universe. The novel does a great job at bringing back the feeling of watching Charmed, as the storyline is virtually identical to the ones we saw on TV. The conversations were very realistic as well. I would read a line and literally hear it in Phoebe's voice in my head. Granted, it is not a book that will rock the literary world, but I would certainly recommend it to any fan of C I really enjoyed this graphic novel! I am a huge fan of Charmed (the TV show) and I had a blast being back in their universe. The novel does a great job at bringing back the feeling of watching Charmed, as the storyline is virtually identical to the ones we saw on TV. The conversations were very realistic as well. I would read a line and literally hear it in Phoebe's voice in my head. Granted, it is not a book that will rock the literary world, but I would certainly recommend it to any fan of Charmed. Thank you to Netgalley and Diamond Book Distributors for allowing me to read this graphic novel! As someone who was really looking forward to this graphic novel because I am an avid watcher of the Charmed series, I was very disappointed in this novel. although there were some parts that were kept true to the nature of the show (the quick witted banter between sisters) it lacked the feeling of the overall show. I found myself feeling that this adaptation was just lackluster in its efforts. The art Thank you to Netgalley and Diamond Book Distributors for allowing me to read this graphic novel! As someone who was really looking forward to this graphic novel because I am an avid watcher of the Charmed series, I was very disappointed in this novel. although there were some parts that were kept true to the nature of the show (the quick witted banter between sisters) it lacked the feeling of the overall show. I found myself feeling that this adaptation was just lackluster in its efforts. The artwork was beautiful, but I found it odd to have both the drawings and the photos of the Halliwell sisters in the novel, as well as photos that were clearly drawn over to include them into a narrative that they had never been a part of until now. I have to admit that I don't really remember every single detail of the TV show, so I'm not sure where this story fits within the plot, but if I had to guess I would say somewhere in the first half of the fourth season from a few details that the sisters mention. Don't ask me to give you exact episodes though because I can't. I didn't know that there were Charmed comic books, so finding this one on NetGalley was a very nice surprise. It was also a plus that the Review copy provided by NetGalley. 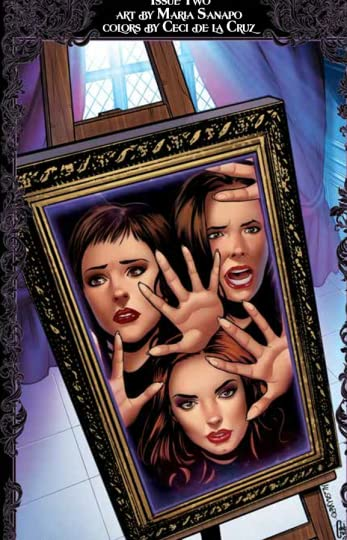 I didn't know that there were Charmed comic books, so finding this one on NetGalley was a very nice surprise. It was also a plus that the cover art is so beautiful. You can easily recognise each of the three Charmed ones and there's also a mysterious demon and the Book of Shadows. The artist even got Paige's paleness compared to the other two sisters right. Unfortunately, this doesn't translate to the rest of the comic book. I found it quite hard to see which one was Paige and which one was Phoebe. Piper is the easiest to spot and in some scenes and it was only because of the length of her hair. It's not a huge issue, but it made me have to pay close attention to their clothing to figure out who was saying what, which sometimes distracted from the plot. About the plot, it did start as something very mysterious and intriguing, but the more pages I read, the less interested in it I was. The problem I found is that the mystery doesn't is not too well paced. Also, this comic book suffered from not having too many pages. It's not objectively short compared to other comic books of different tv shows, but the story wasn't well distributed among all the pages. It feels as if the introduction is huge and the end very short, which affected the suspense. Cutting some of the side plots, such as Phoebe's work problems, and devoting this space to building a stronger ending might have been better. Remember watching Charmed on tv? I always looked forward to seeing the next episode. The three sisters are powerful witches especially when they "work" together. Demons from the place known as hell are afraid of them so stay there even though they rather not.demons want to gather human souls so they can be out and about doing their "thing." One demon has figured out a way to get human souls for himself and his fellow demons. He also wants to get rid of the Charmed witches. Will he be able to do Remember watching Charmed on tv? I always looked forward to seeing the next episode. The three sisters are powerful witches especially when they "work" together. Demons from the place known as hell are afraid of them so stay there even though they rather not.demons want to gather human souls so they can be out and about doing their "thing." One demon has figured out a way to get human souls for himself and his fellow demons. He also wants to get rid of the Charmed witches. Will he be able to do it? How? Looking at the storyline and the illustrations makes this a fantastic volume to read and enjoy. I think that they caught the witches and their persona perfectly. I enjoyed this immensely. Nevertheless I call myself a Charmed fan so I was determined to love Dynamite’s take on my favourite sister witches. I was so excited when I discovered Dynamite had bought the rights to Charmed. I love Dynamite. But I was a little disappointed when I realised it was a reimaging and that it wasn’t a carry-on from the Zenescope comics∗ that where season 9 and 10, carrying on from the TV show (8 seasons aired between 1998-2006). ∗Season 9, 2010–2012, Issues: 24 & Season 10, 2014–2016, Issues:20. I used to watch Charmed since I was a child, so when I saw that there was a graphic novel for the tv show, I had to pick it up. The storyline seems to be what a typical episode features, which included the right doses of danger, sassiness, and the power of 3. So, I was happy with that aspect. I didn't like the illustrations at all. I had a difficult time distinguishing who is who through out the entire comic. This was a huge turn off for me. Now, I did say that the story had the correct dose of sas I used to watch Charmed since I was a child, so when I saw that there was a graphic novel for the tv show, I had to pick it up. Now, I did say that the story had the correct dose of sassiness, but the kind of sassiness that belonged to each individual of the charmed ones was mixed up. I received an eARC in exchange with an honest review. I was a big fan of the tv series Charmed. When I saw this comic strip based on the show and characters, I got super excited. Unfortunately, I was never a big fan of comics and was not really captivated by the stories. I am not sure if a comics fan would feel more comfortable with this way of presenting the story. All I know is that it wasn't for me. I couldn't get into the story. And personally, the 3 sisters were drawn so similarly in some scenes that I couldn't tell them appart and it created I was a big fan of the tv series Charmed. When I saw this comic strip based on the show and characters, I got super excited. Unfortunately, I was never a big fan of comics and was not really captivated by the stories. I am not sure if a comics fan would feel more comfortable with this way of presenting the story. All I know is that it wasn't for me. I couldn't get into the story. And personally, the 3 sisters were drawn so similarly in some scenes that I couldn't tell them appart and it created confusion. As a fan of the Charmed television show, I greatly enjoyed this book. The artist did a wonderful job representing the characters featured in the program, and as well as creating panels that look like they were pulled directly from an episode of the series. There is also a creative and interesting story presented here. I am glad I encountered this title, and would recommend it for fans and those who are new to this universe of characters. Although I love charmed the TV show I knew this wasn't that and couldn't expect much. The graphics weren't as I expected and the dialogue was hard to follow at times. The story line was good but a few times I wasn't expecting one of the sisters to act the way the author wrote. As a fan I could notice more flaws within the novel and within the characters. This book wasn't the best representation but it was nice to have a new story about the sisters. I read from another review that the story is very good, but the constant change of the characters appearance is very off putting. And I really agree. I loved the show and I was really hoping to find another way to rejoin the Charmed universe. This isn't bad, but I'm much more excited about reading the series Season 9 than I would be to read this. I loved Charmed as a child and still watch it today so I was really looking forward to reading this comic. Unfortunately, the characters don't really look like they do in the TV series and the timeline seemed rather off at times (Paige working as a whitelighter in season 4, for example). But it was still a nice throwback and the storyline was interesting enough. This was a fun read! I loved it! This was a great read I love charmed and all things charmed so when I found out they were doing more of these of course I had to read them. I liked the idea of this, but had no idea when it took place? I just finished watching the series for a second time so I know it has to be somewhere in the middle. ok graphics my review copy didn't have any text tho! Talk about nostalgia! Loved it, made me want to re-watch the Charmed series. Found this comic book series and straight up fan-girled. Can't wait to read the next 3 volumes and issues 6-19! I borrowed this from hoopla thinking it was the season 9 continuation and that left me very confused, but also this was just Not Good.